I’ve been thinking about the light and dark and how here in the United States each passing day brings more and more concerning news. We are living through an unique time period that has a surreal feeling to it. There are many polarizing issues with such a big gulf between them; from gun control, global warming, immigration, to race relations and gender issues. What seems clear to me, is not to others who have their own different beliefs. I’m sure they feel the same as I do. Arguing about the issues has not been productive. There are no easy answers. I again started thinking about Carl Jung’s term the shadow and how what we don’t see in ourselves gets projected onto others. I think on a collective level we are all dealing with unhealed wounds from our past and collectively we need to blend the light and dark within ourselves. Moonlit Dove with Sunlit Crow is a new painting of a white dove flying toward the moon and the black crow flying toward the sun is the result of my pondering. Getting back to painting is helping me refocus my energy away from absorbing too much negative news to being more centered and peaceful. This is helping me integrate my own anger issues that will hopefully reach out into the collective and help in some way. Woman with Dove and Lilies is my most recent painting. I’ve worked on it off and on throughout this rainy week. It’s pouring now as I write. Next week they say the sun will be coming back, I think everyone here in Atlanta is more than ready for that. I’ll put this print up in my Circles Round the Sun Etsy Shop under my portrait section. I’m off now to start a new painting, hope all are enjoying the weekend! Peace Dove Rising is my new painting. 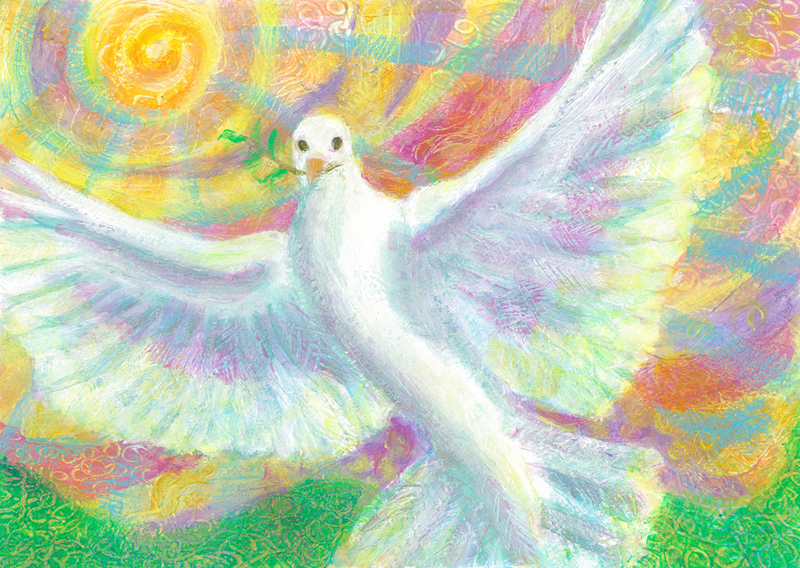 Each year in honor of International Day of Peace (Sept. 21st) I paint a white dove. It’s a day is observed by people all over the world to encourage peace within and among nations. Last year’s painting was a night scene which I titled, Darkest Before Dawn because at that time things appeared bleak. This year I felt like painting a happy, uplifted dove. It seems to me that progress is being made. There have been new major agreements occurring between nations. Leaders, political and spiritual, are shining light on major problems in our world in which we the people can come together and solve. Darkest Before Dawn is my new painting. 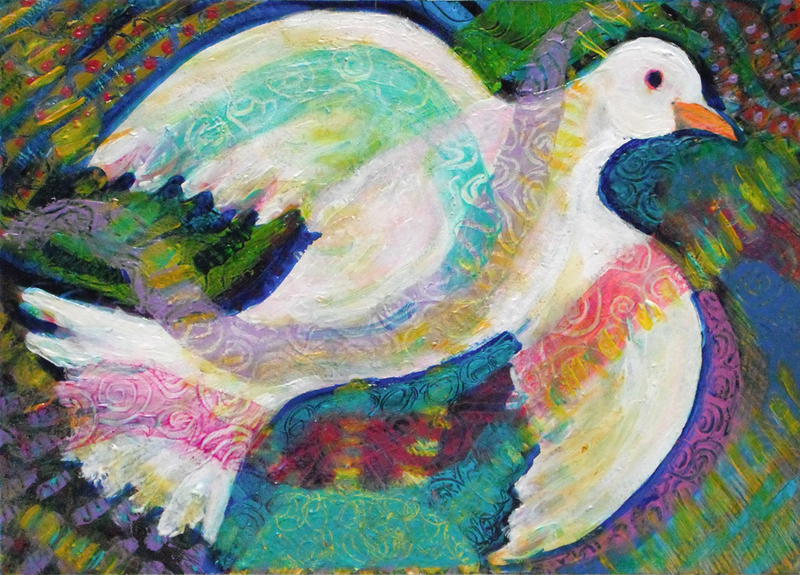 Each year around the International Day of Peace I like to paint a dove of peace. I’m a little behind the curve as the date was on September 21st but better late than never. 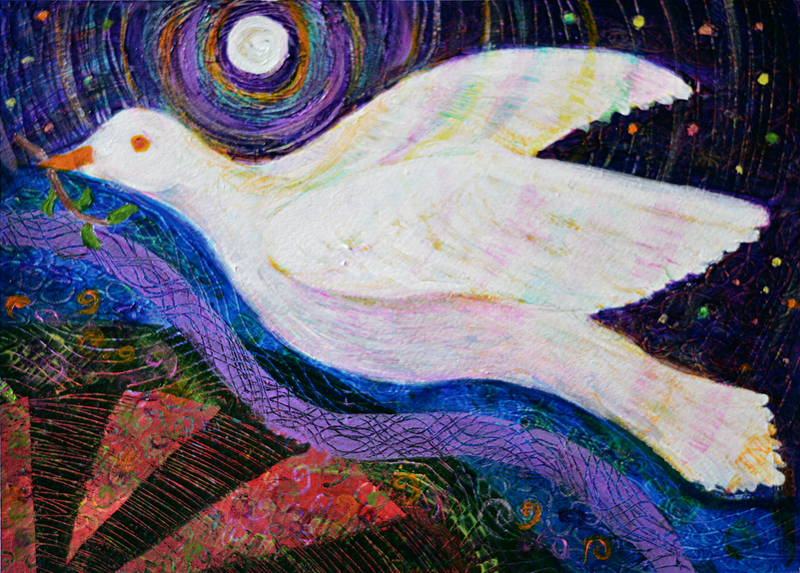 I decided to paint a dove flying at night as lately it seems that there is a continuous stream of bad news in regards to world and national events. It is my feeling that the negativity that we are seeing and that many are experiencing will pass sooner rather than later and that actually many positive things are happening under the radar of the sensational news. With the new season I seem to be settling down and better able to focus on painting which feels good. May this new season bring with it more hope and peace to everyone. Spring is here! The cherry tree blossoms are out along with the early flowering shrubs and bulbs. It’s lovely and the weather is forecast to be mild this weekend. I plan to get some gardening in. 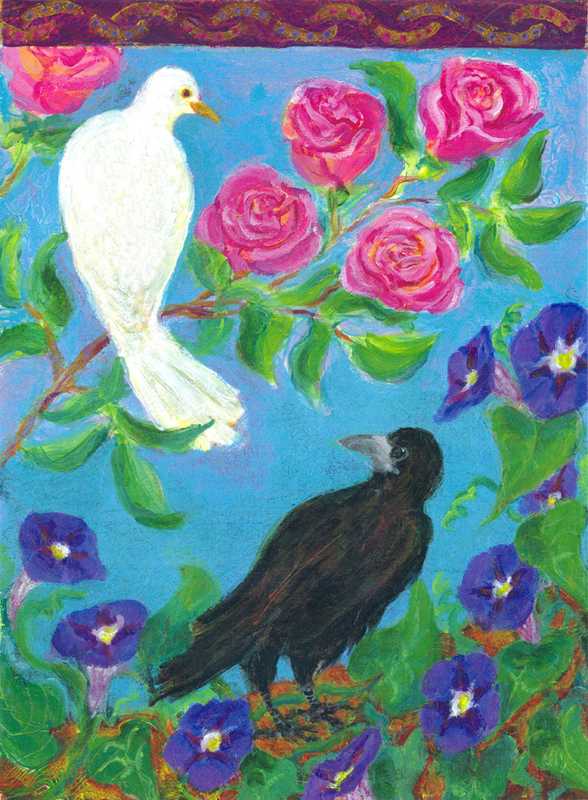 Here is my most recent painting, The Dove and the Crow. I got the idea to paint these two very different birds together because I’ve been thinking about how our world needs more balance. The white dove symbolizes peace while the black crow symbolizes wisdom and magic. I’ve painted them looking back at one another as if they could make a connection. There are many conflicts now between the West and East, rich and poor, progressives and conservatives, religious and secular… After a while you wonder why there is so much extreme polarity and why people don’t work together in a balanced way. The Spring equinox brings with it balance with the day and night being equal. Wouldn’t it be great if we could work together through these differences to solve the challenging issues before us. Happy Spring to All! Love lights up the world…with its generous flames. The first day of spring has arrived! 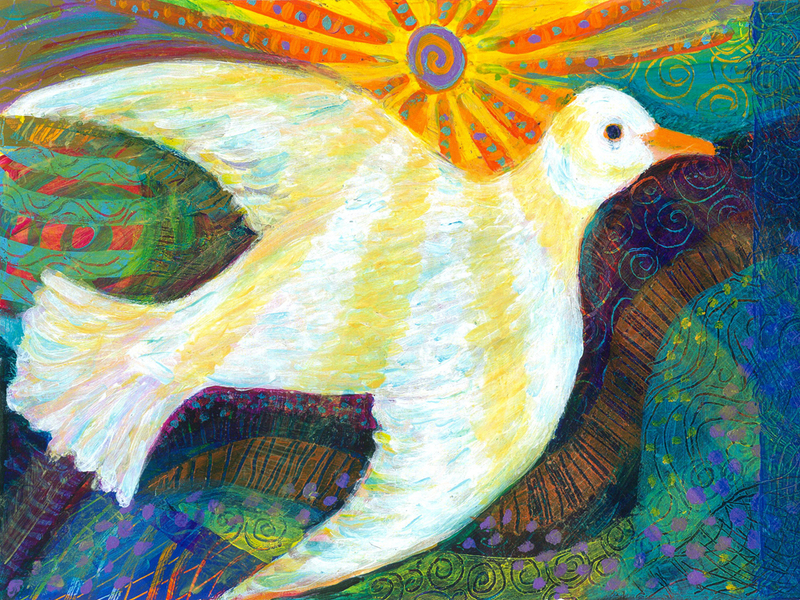 I think my Brand New Day dove painting represents the happiness of this time nicely with the sun returning. This is one of my most popular paintings, I just sold another large framed print at the Flying Biscuit Cafe and am framing a new one today to replace it. Here in Atlanta the flowers are blooming, green grass is appearing, it feels like spring! During my time spent up north in Brooklyn, when spring arrived I wanted to see daffodils instead of the grey slush that I would inevitably step in. Those extra cold months were very challenging for me, just didn’t feel right. The first spring we spent back here in Atlanta after having lived in California for four years, I felt we were in a fairy land. I’d never really appreciated how breathtakingly beautiful spring was here. There’s an Indigo Girls song called Southland in the Spring Time, that describes the feeling well. Where ever you live I hope this spring season will be a joyful time for you.